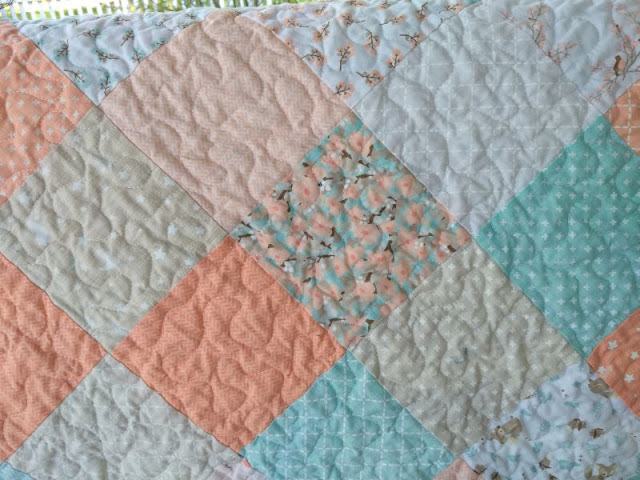 As all quilters know, every baby needs a quilt! 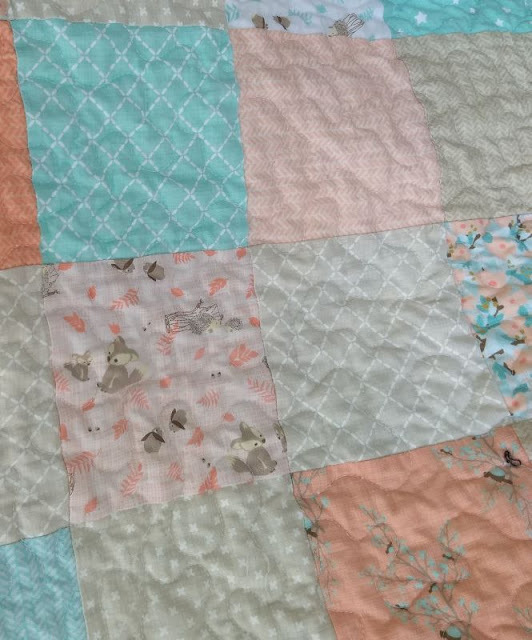 Is there a better excuse to play with fun fabrics, experiment with new quilting designs, and whip out a quick finish than a new baby? I can't think of one. I made this quilt for my cousin's soon-to-arrive baby boy from a Gingiber "Thicket" charm pack and panel. I made this one for his older sister two years ago. Unfortunately, not every baby is welcomed to the world with the fanfare they deserve. 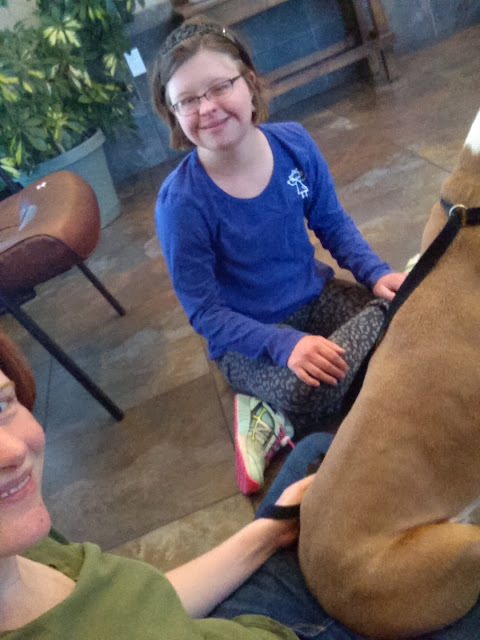 When a baby is born with Down Syndrome doctors, medical personnel, and even friends and family can be negative and less than tactful about the diagnosis. Parents are often in shock and unsure of the way forward. An unexpected and unknown diagnosis can be scary for new parents, but Down Syndrome is nothing to be sad about. (By the way, there's a lovely story here about grieving the child you expected while loving the one you have). 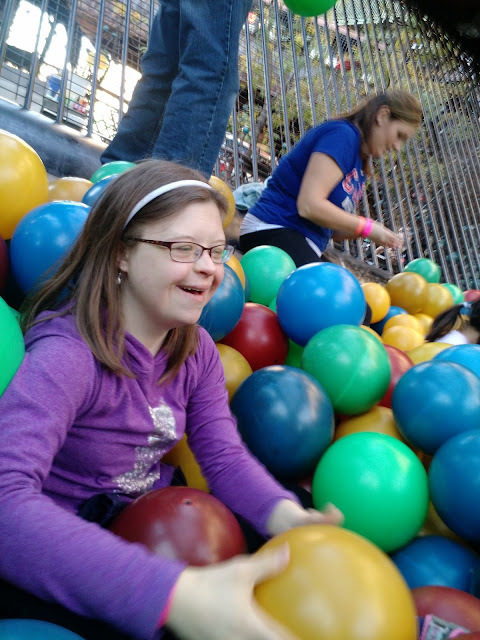 I have the privilege of being friends with a young lady with Down Syndrome and I can tell you she is a delight! She's smart and hilariously funny and full of love. 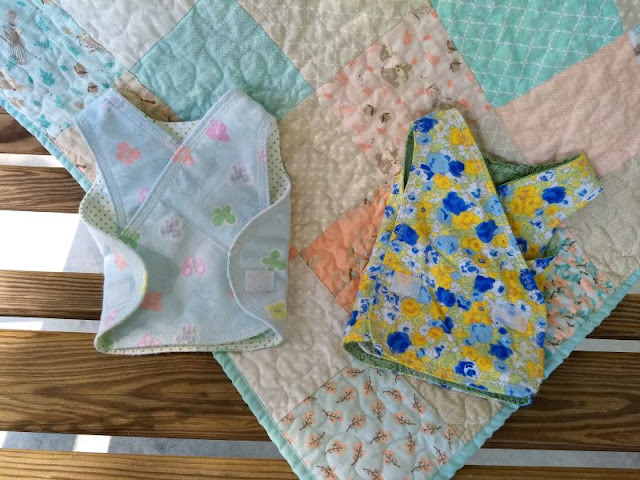 Jack's Basket is a charity that meets parents in the confusing days right after their child's birth and gives them a gift basket full of useful items, information about Down Syndrome and local support groups, blankets and clothes. More than that though, Jack's Basket gives them hope. Hope that their baby is beautiful and has a bright future. 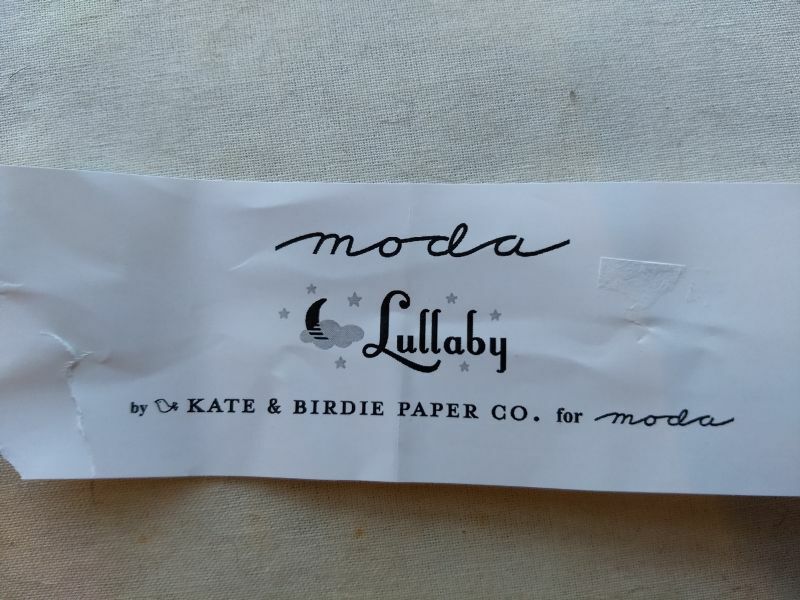 Hope that other parents have been here before. Hope that different is not a bad thing. 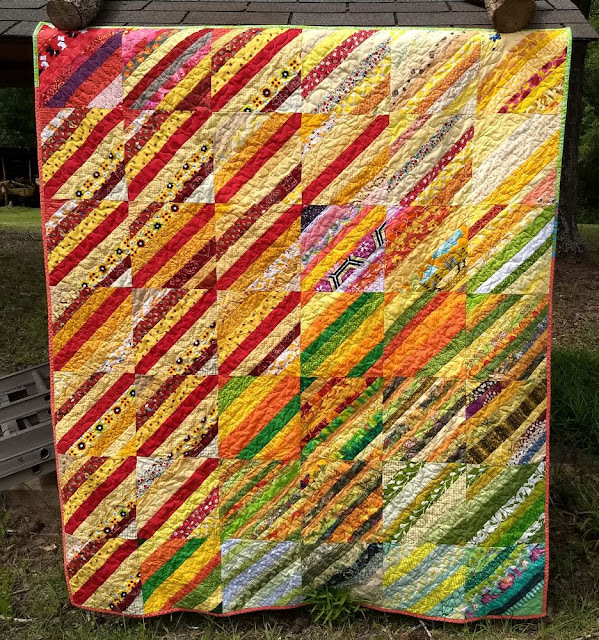 I have loved seeing updates from those of you gifting blocks to Briawna while CiL's block drive is on hiatus. Thank you! You can certainly continue to contribute to her in June but I wanted to recommend another great charity to you. 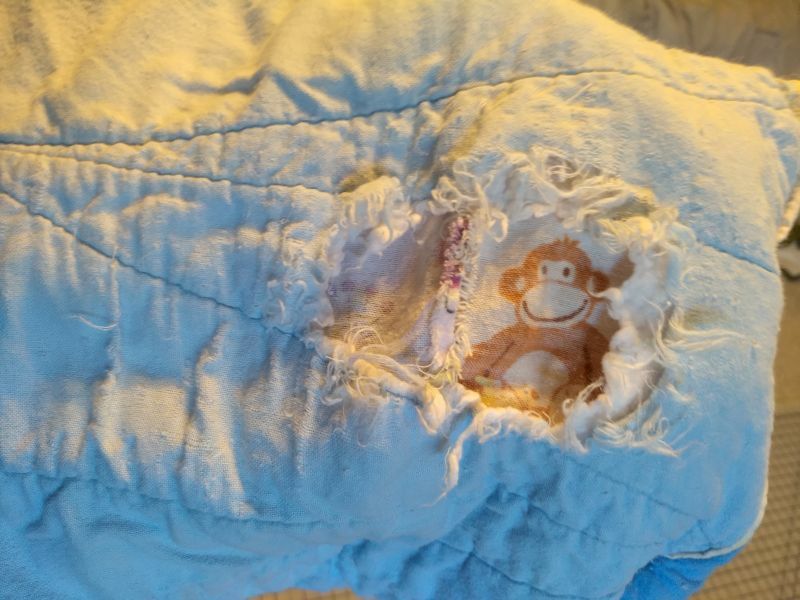 Jack's Basket appreciates baby quilts to add to their baskets. 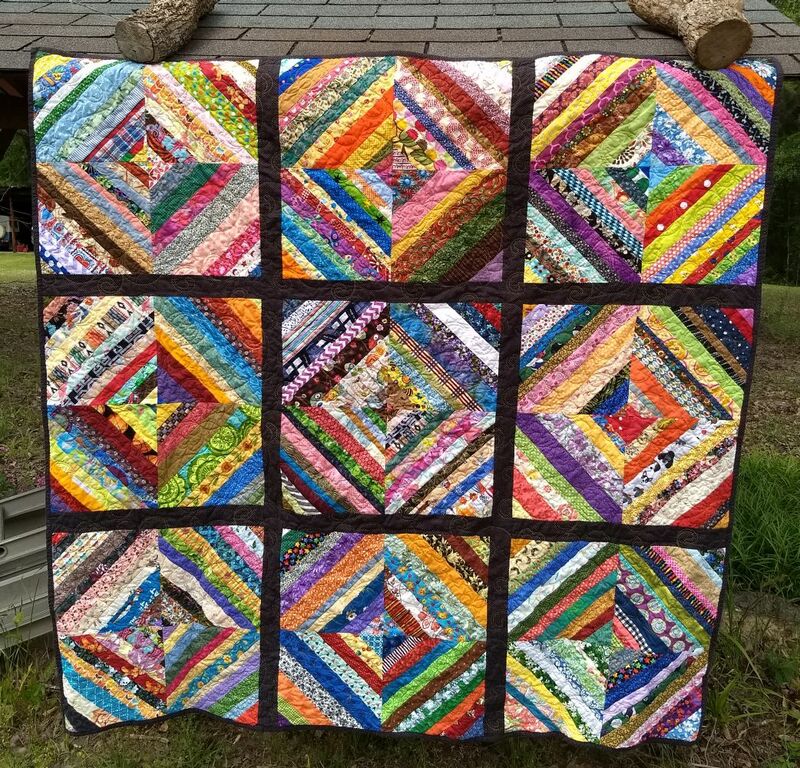 36" square makes a large baby quilt, that would take just 9 of CiL's usual 12.5" blocks. Thank you all for your support and patience while I am catching up. I have already quilted over a dozen quilts and I can't wait to share them all with you. 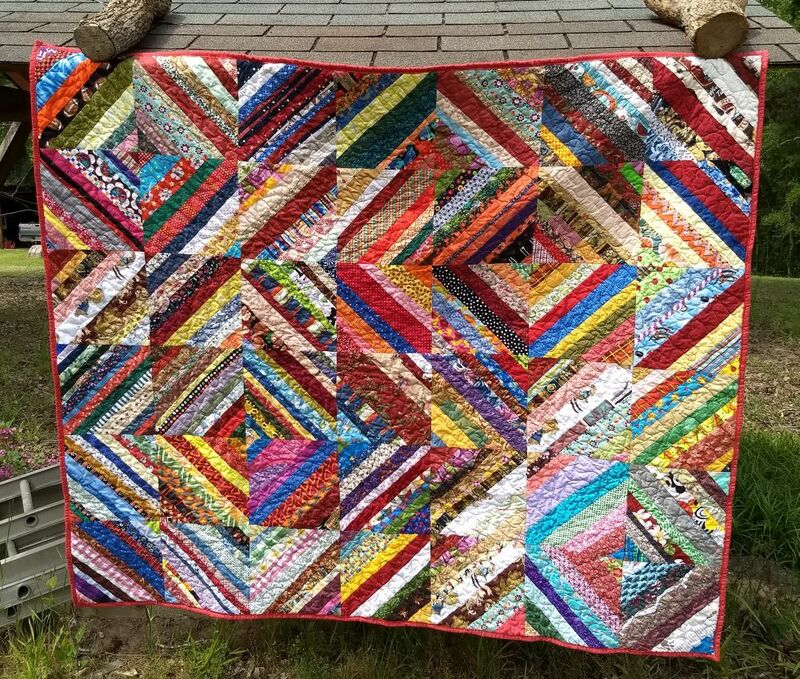 This week's quilt delivery to the hospital put us up to 331 quilts total. In the meanwhile, thank you for sharing the love! Happy weekend! I hope your week went well. This was my first week of the summer semester and it's shaping up to be a doozy. 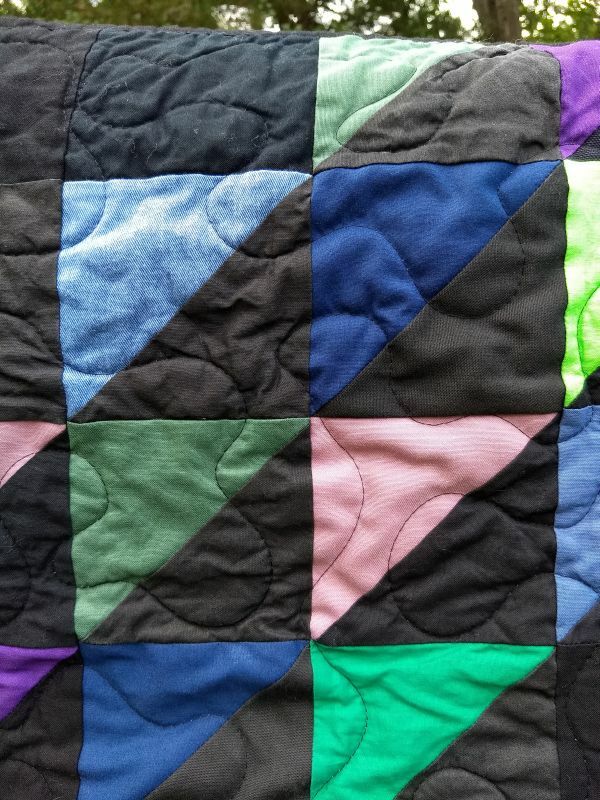 Fortunately quilting is a stress relief for me, so it continues at a good pace. 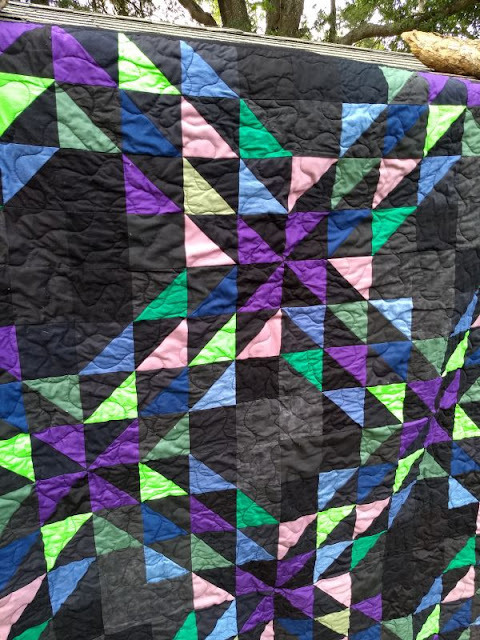 These two beautiful quilts came to CiL via a circuitous route. Betty sent the tops to me, she said they'd been sitting in a box at her house for some years. They were made by another quilter she knew in an online quilting group who passed away. 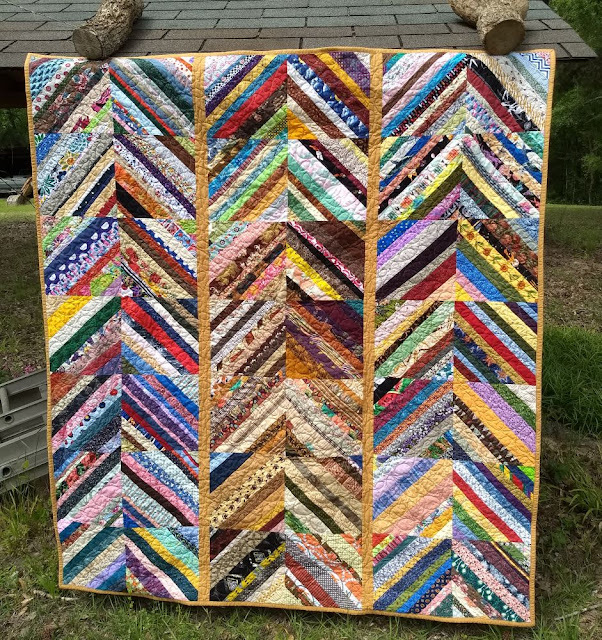 When that woman's husband needed to re-home her quilting stuff he turned to her group members and Betty found herself with some, including these tops. The black background makes me think they look Amish-style. I love how she pieced with so many different black fabrics and the many textures in the colored fabrics. This log cabin was almost certainly meant to be bigger; there were 2 extra blocks with it. 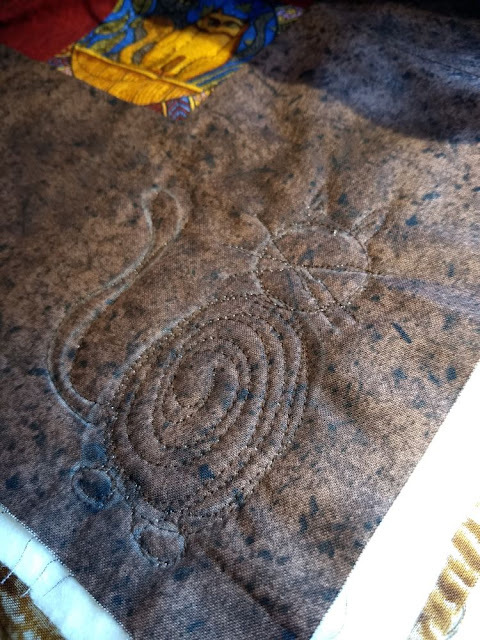 But, it's big enough and done is better than perfect :) I quilted them both with a stipple and I'm so glad they are in Covered in Love's stash now. Here's a little cuteness to start your weekend. Someone was sleeping in the sink the other day when I got up. 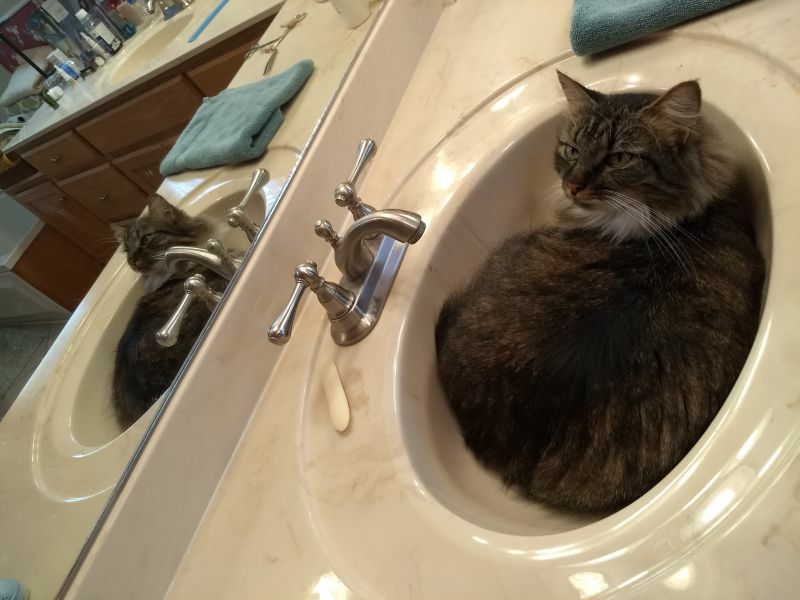 She gave me such a look when I woke her up, I went to brush my teeth somewhere else. Covered in Love is taking a break from the block drives for the next 2 months so I can catch up, but don't go anywhere! I still need your blocks. Check out details HERE. I had so much fun quilting this awesome cat-themed top this week. Debbie S. sent in the top back in the Fall and I've been meaning to get to it for way too long. It's done now and in the stack for the next Covered in Love delivery. The cat fabric is by Dan Miller and each one is fussy cut. 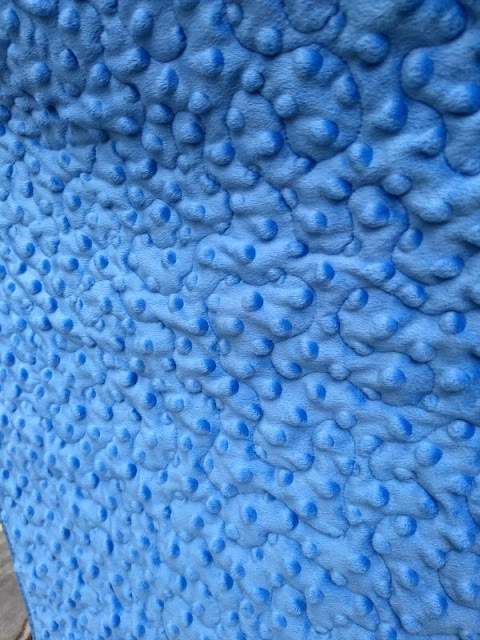 The white plaid in the snowballs has a nice texture, too. 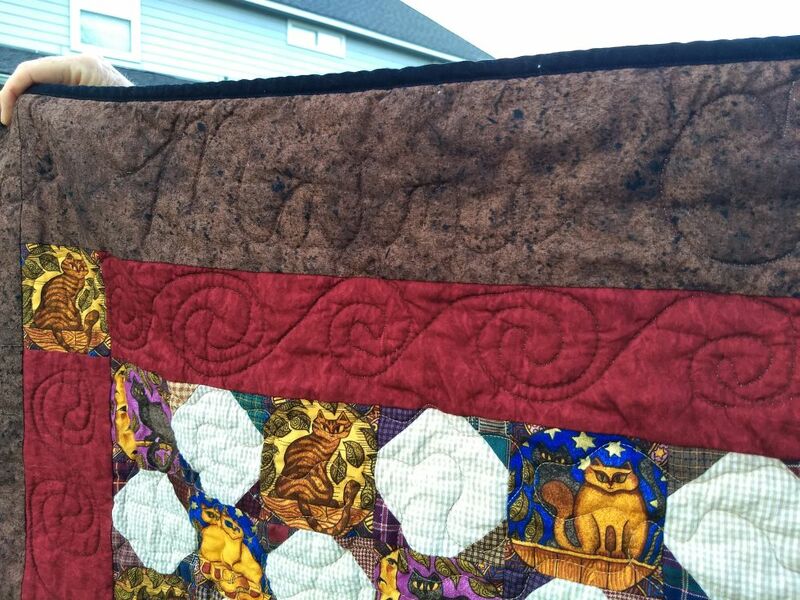 I also quilted four cats based on this design from the Inbox Jaunt. Two were more or less the same as the tutorial, then I did one lying and one from the side. The matching thread makes it hard to see all the quilting, so that will be fun for someone to discover. Thanks to Debbie for the top, Sandra and Gail for backing, and Nicki for binding! Thank you to everyone who continues to support CiL! Happy Friday! I've actually had a super productive week, but not too much of it was very photogenic. For one thing I sorted a bunch of hunter's star blocks and laid them out on the design wall so I can assembly-line sew them together later. Probably half of them I have ready to go into tops now. I also pieced 3 string tops together and made some backings. 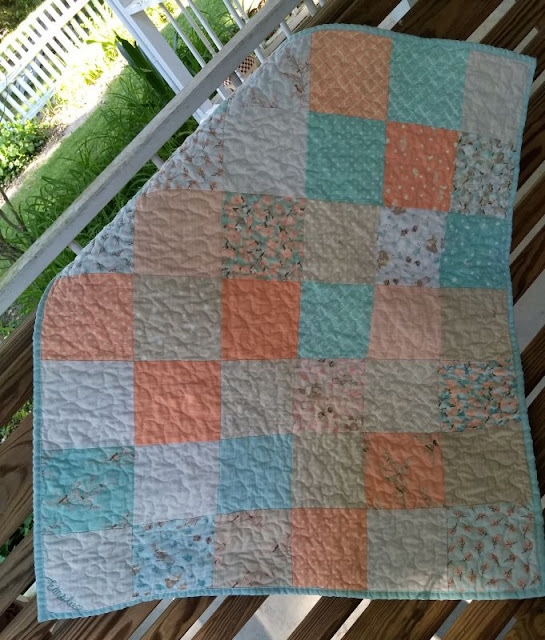 I also made and finished this sweet quilt from a charm pack for a little baby who was born too soon and is hanging out in the NICU for the next few months. I just loved this charm pack, SUCH pretty colors and sweet little designs. 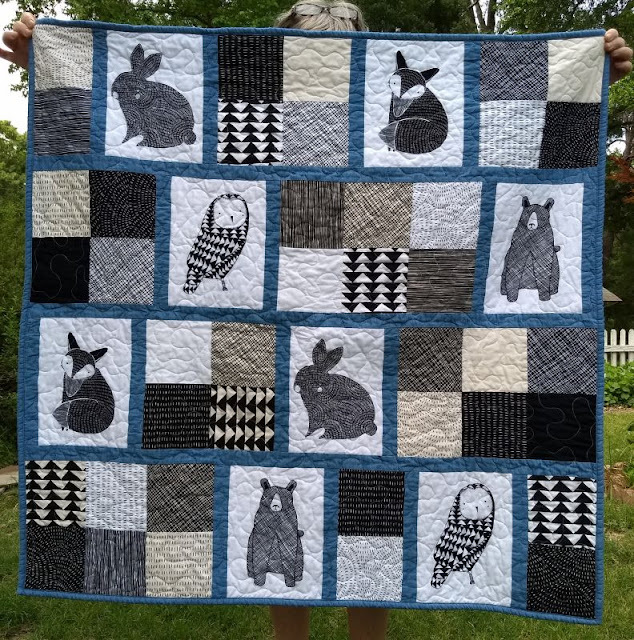 Foxes and bunnies and birds. For now it can go over her isolette to keep it dark and later she can wrap up in it. 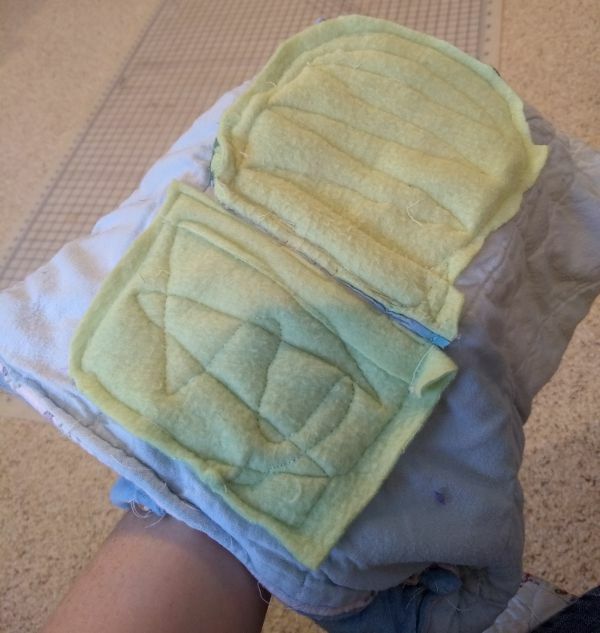 I also made a couple of these reversible preemie gowns. The baby isn't big enough yet to wear anything, but inbetween when she gets a bit bigger but can't wear clothes yet hopefully she can wear these. Like adult hospital gowns they go on easily and have room to tubes and wires to come out. And they're cute! 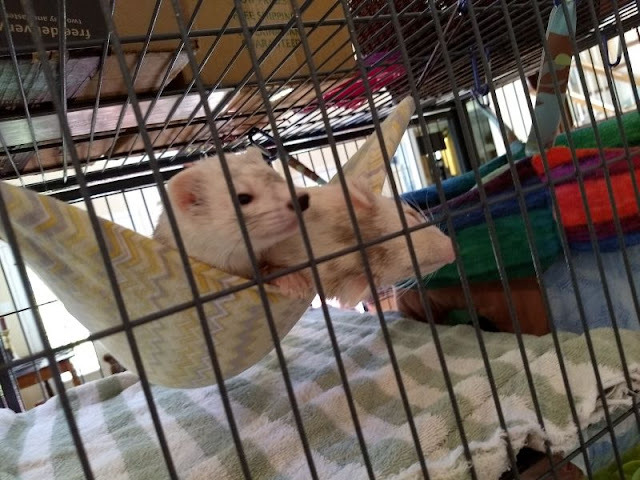 My other "finish" was a ferret bed repair. This big boy is Bubba Bear and his very favorite bed is a tent I made. Since ferrets sleep upward of 20 hours a day beds are very important to their lives. 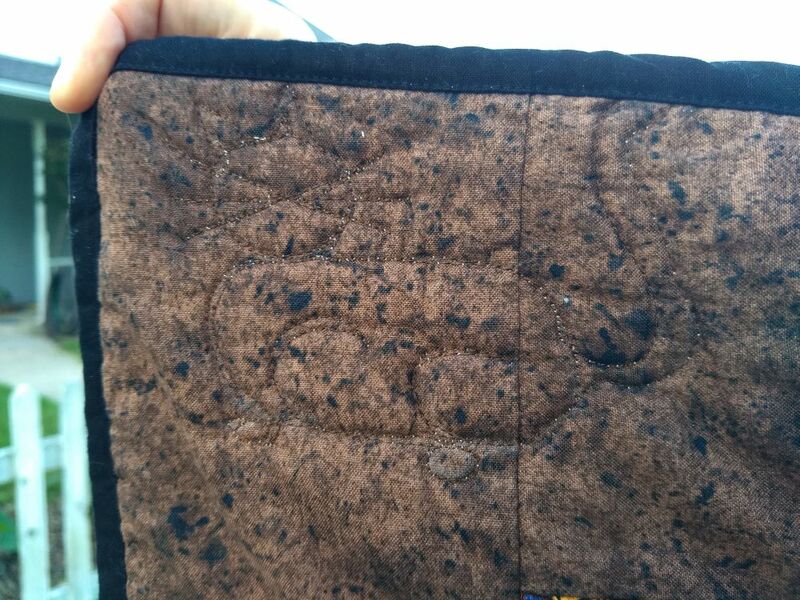 For unknowable reasons Bubba likes to scratch at the floor of the tent and he had scratched a hole right though. I patched it with a couple pieces of fleece to reinforce the floor and he's already moved back in. 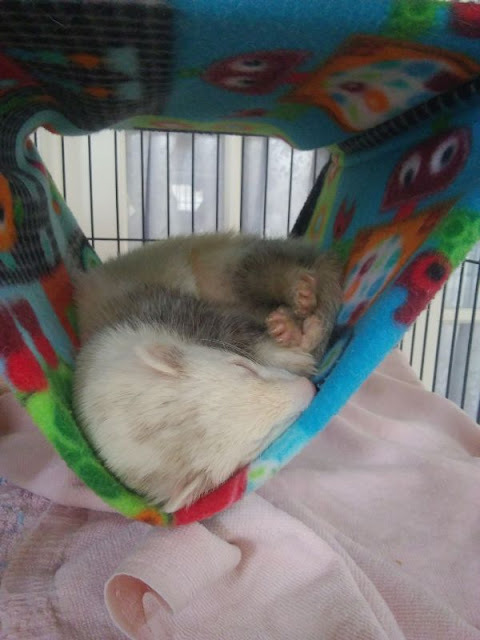 Note the sag in the floor of the tent in the picture below, that's a sleeping ferret. Seriously, these two. The trouble they cause never ends. 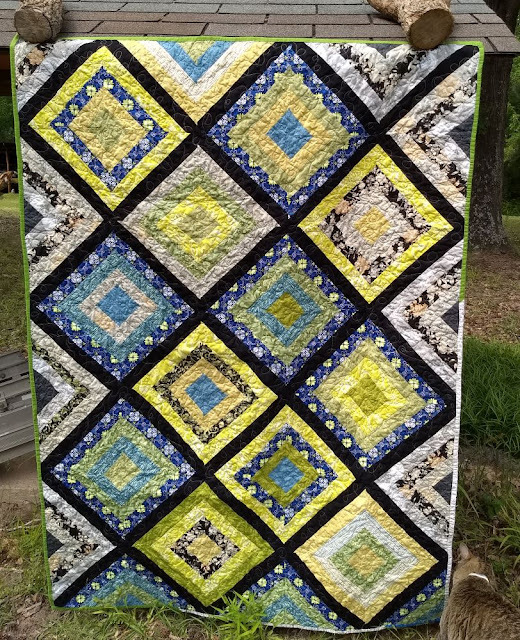 The first 5 of the Jan/Feb string block quilts are done! Not only are there going to be more quilts from this drive, but I think they are going to look better than ever. 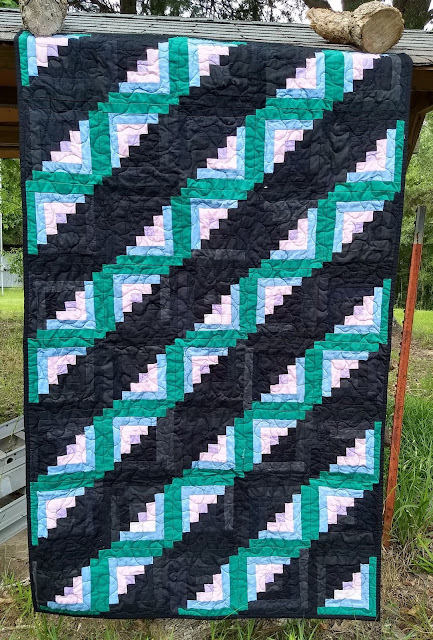 Nancy K. volunteered to assembled a couple of batches of block for me and her friend Jenn did lovely quilting! 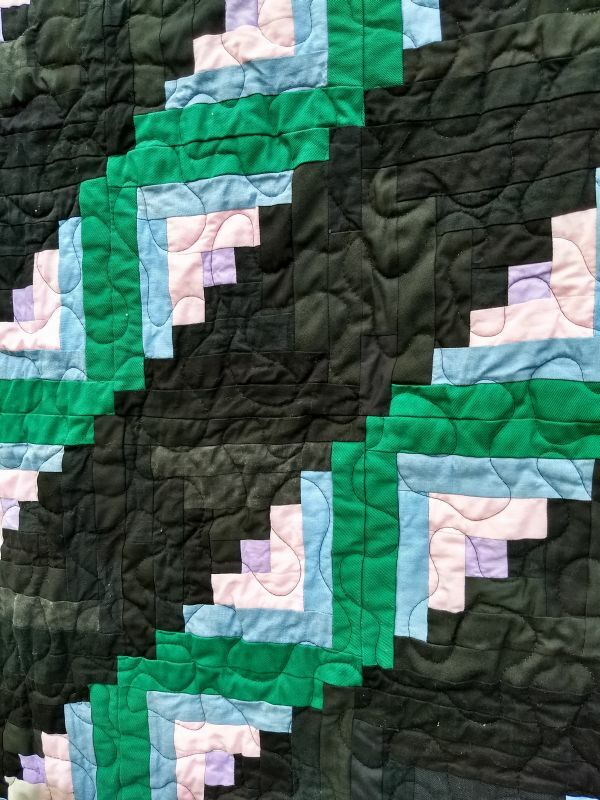 The quilt above got loops and the one below got a pretty lily flower motif. 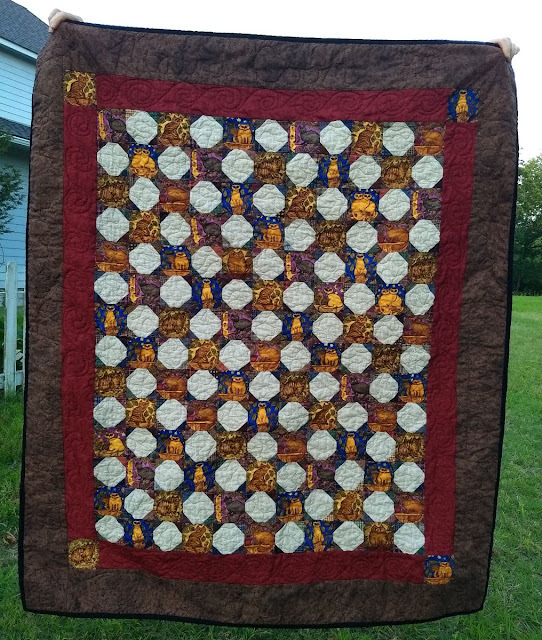 I really love how Nancy changed up the design with the sashing. 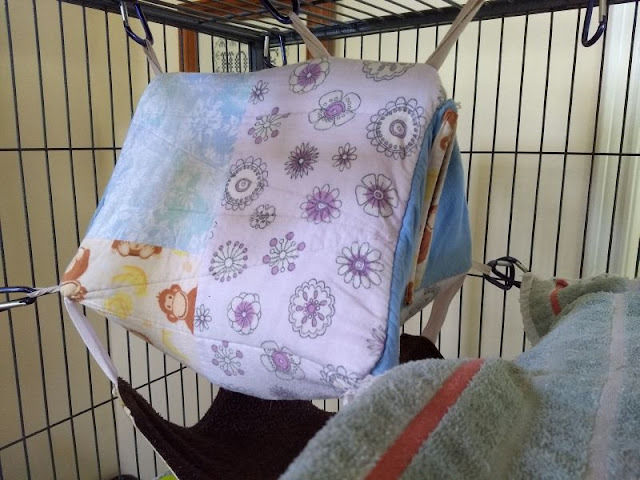 Tammy S. also volunteered to put together a stack of blocks and quilt them. I really like the design she made with these scattered diamonds. Katie G. sent in this top already pieced and a local quilter, Angie C., volunteered to do some quilting for CiL. 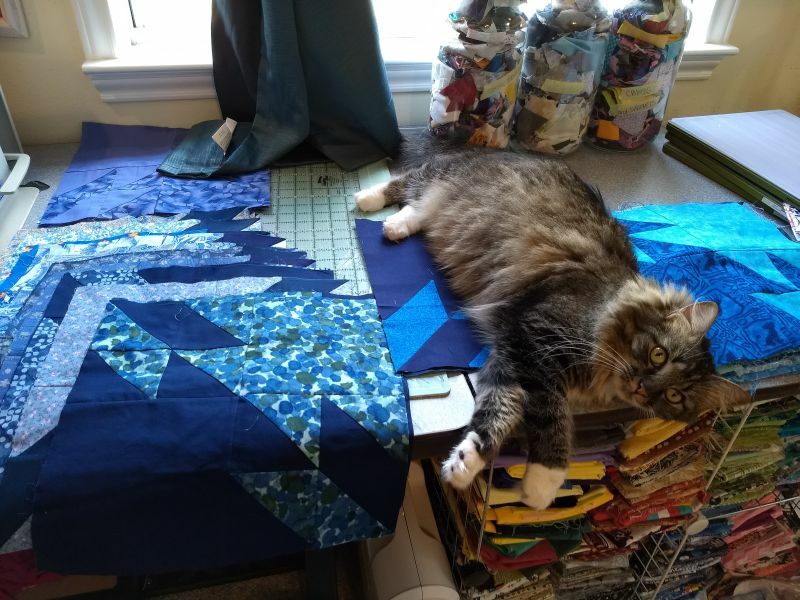 She just got a new machine and wants to practice. It's a win-win! 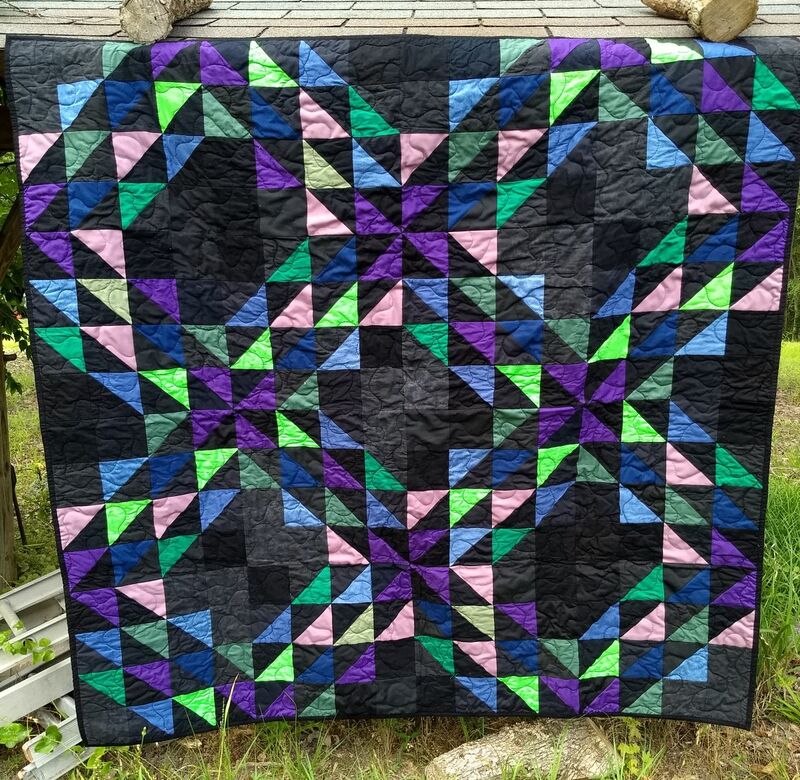 Finally, this top was pieced and quilted by me. The blocks are sets made by 4 or 5 people that just came together really well so maybe you can spot some of yours. I quilted it with a quick stipple and bound it with scraps. 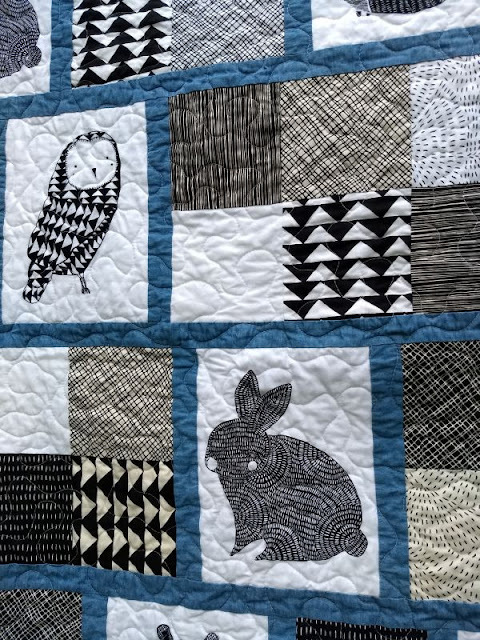 Backings for these quilts came from Sandra, Amanda, Katie, Nancy, and Gail. Thank you for all your help! 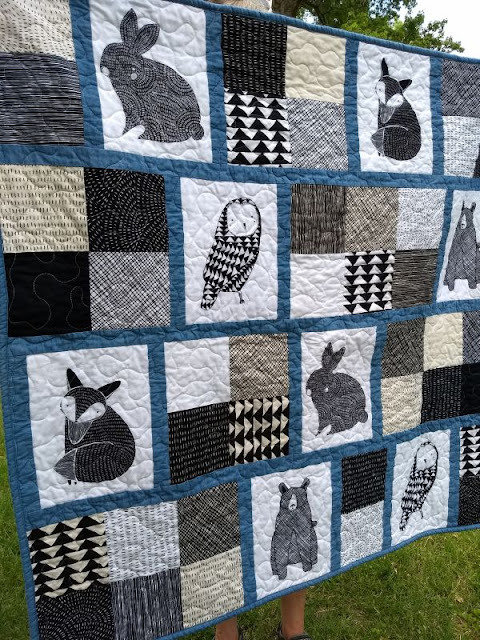 In the coming months there will be 30+ of these quilts getting finished.